By LaGayle ~ December 21st, 2011. 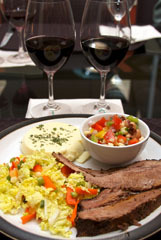 Beef brisket is usually associated with barbeque; however, at this time of year, cooking outside is not always feasible or enjoyable. Having been in the cattle business in Texas for many years, Iâ€™m especially partial to the Texas Beef Council whose website offers some great recipes. For this monthâ€™s challenging wine pairing, we had two wines that we wanted to include in one of our pairing challengesâ€”both of which were Mourvedre. So, rather than having the usual two different varieties to compare with the meal, we tasted the same variety to determine which particular wine paired best with the brisket. I found a brisket recipe on the beef council website that is baked in the oven rather than prepared with the more common outside cooking method. Once the main entrÃ©e was set as peppered beef brisket, I decided to round out my entire menu from recipes found on the site, including Texas caviar (made with black-eyed peas and corn), garlic flan, and kickinâ€™ slaw (made with Napa cabbage). As you might expect from a group of Texans, we thought the meal was fabulous. 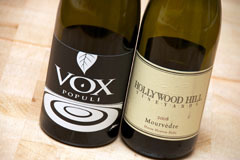 The two Mourvedres that we paired with the meal were the 2009 Rasa Vineyards Vox Populi Mourvedre and the 2008 Hollywood Hill Vineyards Mourvedre. Both wines were excellent, and we went back and forth trying to determine which we believed paired best with the peppered beef brisket. The final tally had the Vox Populi in front by a 3 to 1 margin. Really, though, you canâ€™t go wrong with either of these wines. 2009 Rasa Vineyards Vox Populi Mourvedre (Columbia Valley, Washington): 100% Mourvedre. Deep purple in color. Very aromatic with plum, game, leather, and earth on the nose. Pepper, spice, black cherry, and plum come through on the palate. Medium to full-bodied with lively acidity and medium tannins. Well-balanced with a long finish. Gets even better with food. 2008 Hollywood Hill Vineyards Mourvedre (Horse Heaven Hills, Washington): 90% Mourvedre and 10% Syrah. Deep, purplish red. Nice nose with a lot of red fruit and floral aromas. Fruit-forward with black cherry and spice on the palate. Medium-bodied and smooth with medium to high, drying tannins. Well-balanced with a long finish. Glad to hear it. Cheers!